Easy Cooking | Breezy Mama Breezy Mama - Expert parenting advice, celebrity interviews, product reviews for kids, moms and babies and more! I love crock pot cooking–it’s easy, there’s not much mess, and it (almost) always turns out tasty. But then I received an email about the Ninja cooking system. Ahh, I thought, it’s just a fancy crock pot. But when I came to the part that said I could, “make complete meals – layering the main course, vegetables, and pasta or rice inside the Ninja® Cooking System pot – in just 30 minutes, even from the freezer, cutting cooking times by as much as 30 to 50 percent” –I had to test it out. It came in the mail and as I pulled it out of the package, it was as if the world had stopped spinning. My mom said, “Oh, that looks cool!” My friend Jen said, “Oh my gosh, that looks amazing.” My husband eagerly asked when I was going to cook my first meal–even the kids liked it (probably because of the Ninja name). Steam-Infused Roasting and Baking – Revolutionary steam roasting and baking provides quicker cooking, plus healthier and moister results. Steam-infused roasting cooks meat evenly and cuts the cooking time by up to 30 percent, keeping more natural juices in the meat while taking the bad fat out. Baked goods are more moist too, and can be prepared with up to 50 percent less fat. Fast One-Pot Meal Making – With Triple Fusion Heat, complete meals can be made in just one single pot. Home cooks can layer meals by cooking dry pasta, veggies and meats all at the same time in the Ninja 3-in-1 Cooking System. Meats cook more evenly and casseroles have a savory and crispy finish, with more crunch on the bottom and sides. Frozen seafood and other frozen items can even be prepared in 30 minutes. SEAR-ious Slow Cooking – The Ninja Cooking System has both stovetop settings and slow cook settings which allows the home cook to use the same pot to sear and brown meats and vegetables to add more flavor to the meal. The stovetop can be used after slow cooking to deglaze sauces, and to add delicate vegetables for a perfect texture. The slow-cooker is programmable; allowing you to set the cooking time, which will automatically keep warm once cooking is complete. For my first meal, I chose something I never cook–pot roast. I truly wanted to test this baby out. Using the stovestop setting, I turned it to high, seared the meat, then turned it to roast and let it cook. Easy, scrumptious, and super fast cleanup. When I tried it again, I made chili–first I browned the meat with the onions on the stovetop setting. I then added the rest of my ingredients, brought it to boil, and turned it to the buffet setting to keep warm. Which it did, for eight hours, without overcooking the chili. Again, the best part was the one pot clean up. I can’t wait to cook more with the Ninja–it truly makes trying recipes easy and fun! 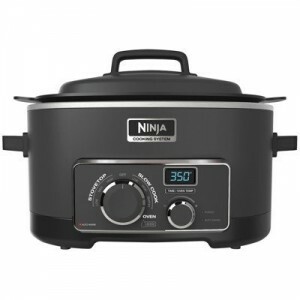 For more information and to purchase the Ninja 3-in-1 Cooking System, $194.99, click here.